If Booster Gold had four dollars and earned six more, how many dollars does he have in all? If Booster Gold travleled forward in time three years and then traveled back two years, how many years forward is he now? While I was busy getting my pantaloons in a bunch last week over Batman #45, Booster Gold sneaked his way into 3 — count 'em, 3! — other comic books. 2. 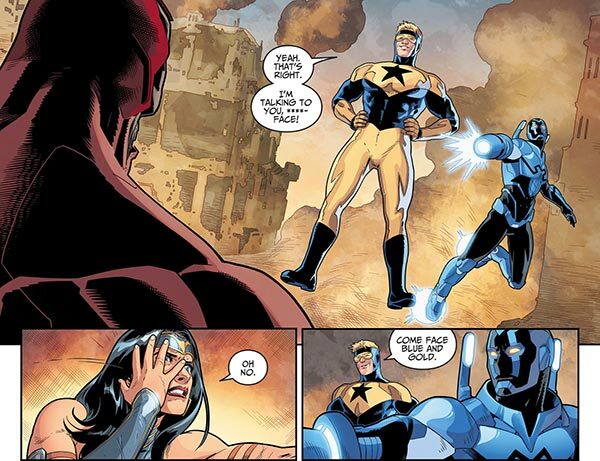 Booster had a slightly larger part alongside Blue Beetle in Injustice 2 #24. This one we knew was coming. I originally mentioned it when it was published digitally at the start of last month. Booster has been showing up quite a bit in the Injustice 2 as of late, with more appearances coming soon. Booster's mom should wash his mouth out with soap. 3. However, I had no idea bout Booster's appearance in Mister Miracle #8 until Shawn slipped notification into Friday's comments. 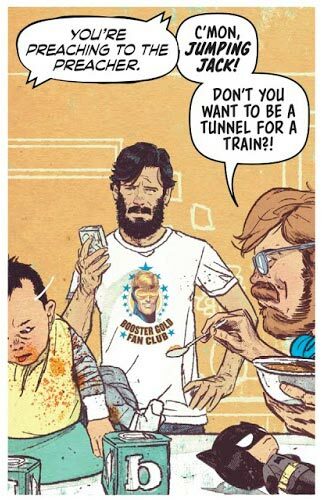 Booster doesn't appear in person, but his face is on one of the many, many shuperhero t-shirts that Scott Free wears throughout the issue. Who knew Mister Miracle a fan club member? So no matter how Booster boosters feel about Batman #45, we can't be disappointed that it was the only place for us to find our hero last week. Booster Gold is everywhere in April 2018! If Booster Gold had four dollars and earned eight more, how many dollars does he have in all? If Booster Gold travleled forward in time nine years and then traveled back two years, how many years forward is he now? DC Rebirth #1 is out today . 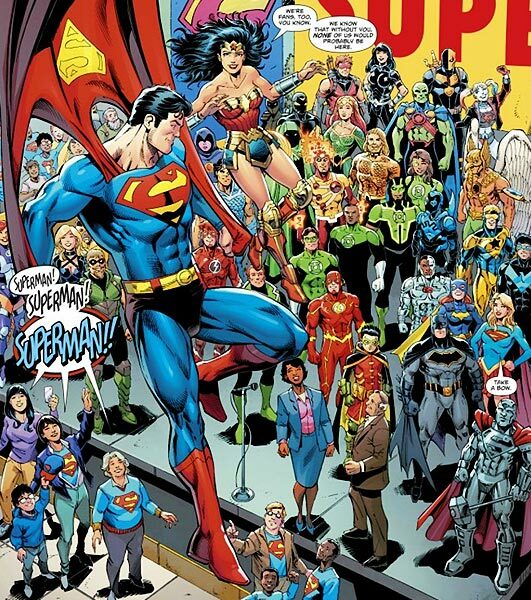 . . and according to Newsarama.com, Booster Gold is not in it. 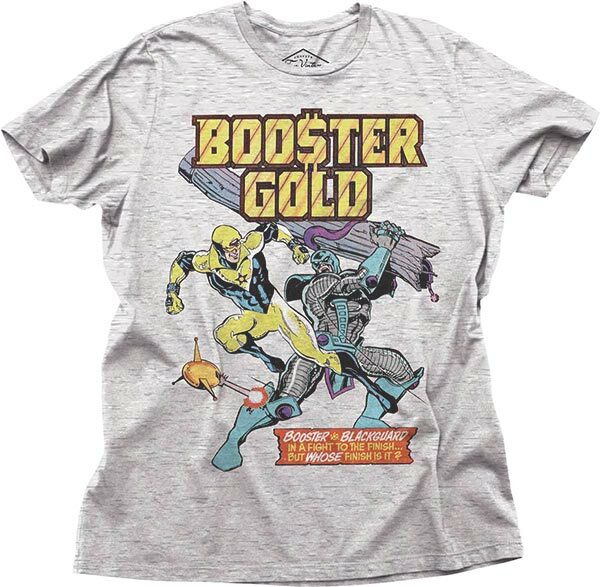 This shirt from Junk Food Clothing reproduces the cover of Booster Gold #1. It should be available in late July for about $18.00. This is a Previews exclusive, so if you want it, be sure to tell your Local Comic Shop so that they can order one for you. Thanks, Shawn. Now that I know you're paying attention, I'll try harder! I am sooooo buying one of these for the entire family! If Booster Gold had four dollars and earned five more, how many dollars does he have in all? If you had seven dollars and then spent six dollars on Booster Gold comics, how many dollars do you have left? I'd like to end the week with an extra special thank you to Logan Peterson and Shawn Baston, without whom the Boosterrific.com database wouldn't be nearly complete enough. These two eagle-eyed Booster boosters notified me about our hero's cameos in Secret Origins #10 and Grayson #6. No Booster Gold collector needs to feel bad if their collection never includes either of these minor appearances, but we're all better off as a community because we have people like these two watching out for the rest of us. Thank you! If Booster Gold had five dollars and earned ten more, how many dollars does he have in all? 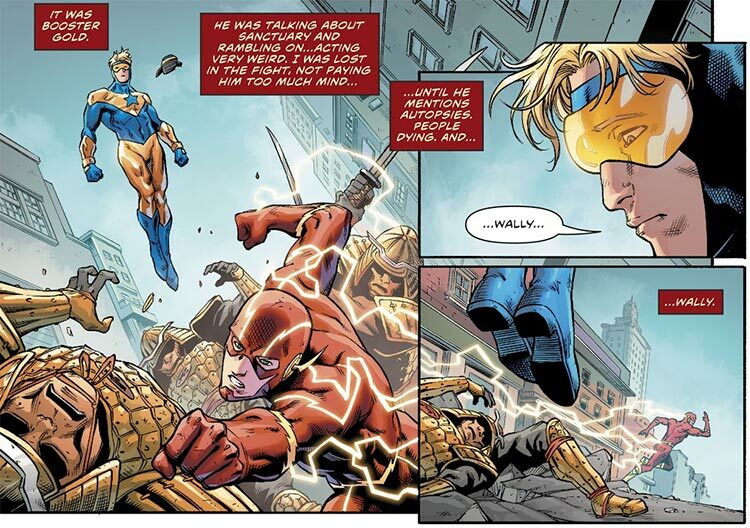 If Booster Gold had eight costumes and Doomsday destroyed three of them, how many costumes remain? First-class Booster booster Shawn Baston sees Booster Gold everywhere, including a recent episode of Kevin Smith's Comic Book Men. In the episode that aired November 23, 2014, you can easily spot Booster Gold, Volume 2, #1 and #12 there between Ming Chen and Walt Flanagan. If you've got great vision, you might be able to make out issue #11 on the left behind Ming's head. I don't know how Comic Book Men runs its store, but you can spot the same issues on the wall behind the customer selling Ultraman dolls earlier in the episode. Is the Secret Stash comic shop filled to the gills with Booster Gold comics, or were these issues just convenient to fill some space the day they were filming? I'm guessing the latter. In any event, this AMC television show has been added to the Boosterrific list of Other Media appearances. Thanks for the catch, Shawn! If Booster Gold stole nine super powers and then stole nine more, how many super powers has he taken in all? If Booster Gold had ten costumes and Doomsday destroyed six of them, how many costumes remain?